We stayed and extra day so we could see some of the local sites. One of Marseille’s really interesting places to see is the Chateau D’If, the setting of “The Count of Monte Cristo” by Alexaner Dumas. I knew I wanted to visit it when I saw it from the Notre Dame de la Garde, the cathedral high above Marseille. With our tickets in hand we went over to the mob waiting to board the boat. This was another long wait. Finally the boat arrived, the gate was about to open, and some guy wearing a motorcycle helmet jumped the fence and ran for the boat. The ticket guy threw his clipboard down and ran after him. We never saw the guy with the helmet again, even though there was only one way off the pier, well actually two, but only one dry one. The ticket man came back looking angry, he milled around near the gate a bit, then did a surprising thing. He went over to another side gate and opened it. At this point the crowd thought he was punishing them for…letting the helmeted man go? I have not idea, but when he opened the gate, the crowd got really ugly. I really thought they were going to take apart the gate. What I think the guy was really doing was letting the locals and a school group board first, but now he started shouting too. I was glad we were kind of on the side where we could kind of step out and enjoy the show cause it would be hard to pick a side and participate. Eventually he opened the main gate and we all boarded. Before we left the ticket guy came on and apologized…I think. One of Marseille’s signature dishes is bouillabaisse, a bunch of us decided we needed to try it. Armed with a reservation at what was recommended by the hotel as a good place for bouillabaisse we headed off after the conference, which happened to be the rush hour in Marseille. It really didn’t matter because the metro had plenty of capacity, but there were more people, and there was a lot more security. One thing I never get used to is automatic weapons in airports. I don’t know if you travel much but lately in US airports there are a lot more machine gun toting security guards. Don’t get me wrong, I don’t mind them there, I just can’t get used to them. In Europe these security guards are pretty much everywhere. At rush hour on the metro there were two rows of them watching everyone coming down the stairs and into the station. We had to wait because one of our party had trouble with her ticket. While I waited I noticed something odd. The first row of security was unarmed, the SECOND row of security had automatic weapons. My question was, what was the first row for, to slow down the bad guys? We got to the restaurant and sat down outside overlooking the old harbor. It was a beautiful night, and a beautiful setting. Since we were on a bouillabaisse mission, let me describe bouillabaisse. It’s fish soup. Yup, fish soup, good fish soup mind you, but fish soup all the same. So it came as a bit of a surprise that this was going to cost more than any meal on the whole trip. I think of the 5 of us, 4 had the soup. I really liked it. With a curry-like stock and three kinds of fish it was what you would expect a fishing city’s people to make when times were tough. I find it interesting that time and time again, local “poor food” becomes the expensive tourist cuisine. This restaurant was also where we learned never to ask a French waiter to hurry with the check. We said one of our party had to catch the bus so would you please bring the check. It took a good forty minutes! I like that they don’t hurry you out, but when you have to make a bus you’d think they would accommodate you. In the end we had to use the metro and a taxi because we did miss the last bus. It was no big deal but it was an important lesson in French behavior. I wonder if the restaurants have a deal with the taxis. I had some time today so I went to the old part of town to look for presents for the family. I had thought I had this pretty much handled when I was walking and found a guitar shop near my hotel. All my kids play guitar so I thought some nice French straps or picks or something. No chance, there was not a single thing in that store that was French. There was not even a pick that had French writing on it. So down town I headed. I had similar problems shopping down town. There are really very few “French” things. Oh, there is wine and cheese but I was surprised that there are so few French products. I finally settled on some local soap made with lavender and some local chocolate made with olive oil. Shopping done it was time for a look around. I am kind of nut about old buildings, so I walked to every old fort and church I could find. There was a lot of beautiful Romanesque architecture down around the old harbor, but there was a big cathedral way up on the hill called “Notre Dame de la Garde” that I had to get to. The long bus ride to a church that already looked big should have been a clue to how really really huge this church was. This place was awesome. It was built like a fortress. The church proper was on a rock about 40 feet tall. To get in there was a staircase to a drawbridge, a thick studded door, a portcullis, and another door. If they say they are closed, they are closed! There were paintings of local ships lost at sea, paintings of WWI and WWII planes down nearby. There were other paintings of these pilots being helped and hidden by the nuns and priests. The painted vaulted ceilings were incredible, and the church is topped by a truly huge statue of Mary. The stone work was beautiful, colored stone and incredible workmanship. I’m an engineer and am impressed by such things so I could go on for ever, but I won’t. But if you go, it’s worth the trip. Outside there were shell marks earned in the liberation of Marseille and you could see the countryside for miles around. As I walked back to the bus stop I had an excellent view of the Chateau d’if, the lodging of the Alexander Dumas’s Count of Monte-Cristo. I promised myself I would try to get out there. I sat down at the bus stop that I shared with about 10 other people, old people, families, just regular people. I was on the end next to the curb, and a young guy and girl sat down there just outside the bus stop. I sat looking out over the city and saw them take out a couple of cigarettes. She lit hers but he took his apart. This caught my attention. He set the tobacco aside and took out a small bit of what looked like a bullion cube, but it wasn’t a bullion cube. He started heating it up with his lighter and crumbling bits of it into his hand. I thought, “he’s going to smoke some hash right here in front of all these people.” Nobody but me seemed to notice but I was fascinated by his audacity. He mixed the hash in with the tobacco and was about to re-roll the cigarette when the bus came. Not to worry, he just moved about 10 feet down the curb and finished up and got on the bus with the rest of us. A 900 year old church and hash at a bus stop, this is definitely not America. Following the…less than stellar choices I made at the last dinner I nonetheless looked forward to another try at French cuisine. Tonight I was the fifth wheel to two couples (two of our happy travelers troupe had brought their wives). We picked a restaurant from the map provided by the conference organizers that was within walking distance from our hotels. Our inability to notice the three stars next to the “word” budget led us to believe that this was a budget restaurant. As it turns out it had three stars out of four on the budget scale so the Euros flowed freely. This was not really a surprise since we were asked if we had a reservation when we came to the door. Luckily she took us in anyway. Let me take a moment to talk about Euros. It is impossible to think of them as anything but dollars. Unfortunately, they aren’t, they are about $1.56. So when you are shopping for trinkets to bring home to the fam and you find a nice bit of jewelry for say $25, you say “Self, that’s not too bad,” then, as you ride home on the metro you realize you have actually spent closer to $40. By far the hardest to get used to is that the little quarter looking things, which come in one and two Euro flavors are actually worth $1.55 or $3.10. They are very pretty money though with a silver center and a gold band around the outside. Every country in the EU has a different back and it’s fun to guess where they have come from. So it was much easier to tell myself that we had an excellent meal for $40 instead of 40 Euros and I am happy in my delusion. This most excellent meal started with a round of truffles on toast. These are the special mushrooms that they hunt with specially trained pigs. I love mushrooms and I heartily enjoyed them. I felt guilty about not being overwhelmed by the awesome taste though. I have read about truffles my whole life and I expected something, I don’t know, remarkable. They were good mushrooms but…maybe part of what makes one appreciate the overwhelming worth of truffles is to have a hand in the training and handling of the hunting pigs. There was a salad with a wonderful mix of different greens, the bitter and the sweet made a subtle blend of tastes. This was followed but excellent salmon, (ok I was playing a little safe). We had the house wine and I discovered something that I personally found no exception to throughout the trip, even the house wine in France is better than most of the wine I buy at home. For dessert, a caramel flan, simple but nicely done. In France you will never get the bill until you ask for it. If you sit there for 3 hours no one will be leaning on you to leave. So you have to ask for the check, but never, never, never ask them to hurry. We did this once later in the week when we wanted to catch the last bus. That waiter took a good 40 minutes to get the check. Anyway this check came with a shot of aperitif, we had melon or apple to chose from. A little booze always makes a bill taste better. Our waiter, and I suspect our cook, helped us tourists with our menu throughout the meal because he spoke the best English in the place, and even had a shot with us. In my whole trip the only place I saw the legendary French surliness was at the bank. Maybe what some American tourists see as surliness is really that the French don’t suffer jerks, and they don’t take if for granted that you not a jerk until you prove otherwise. Day 2 Arrival and THE WORST THING YOU CAN PUT IN YOUR MOUTH! We arrived having breezed through customs. Via bus, and metro (subway) we got to our hotels. 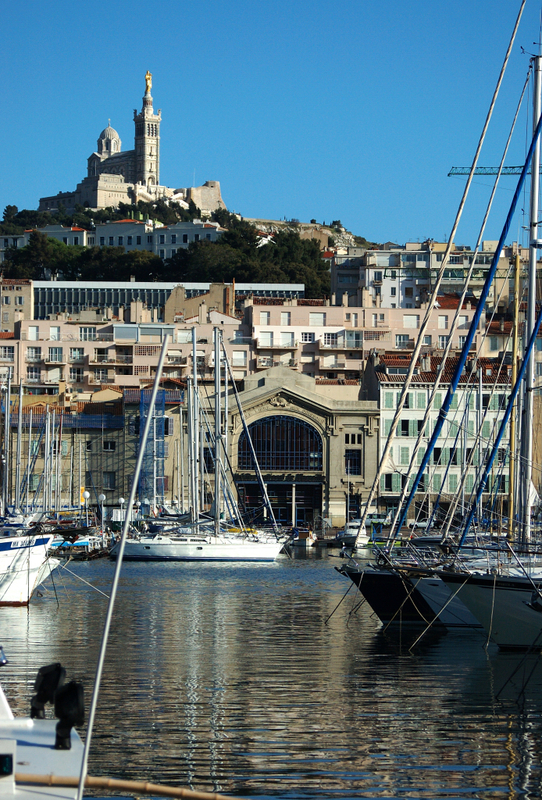 Our first big surprise is that Marseille pretty much rolls up its sidewalks on Sunday. There were a few sidewalk cafés open but most everything was closed. As luck would have it, one of the open cafés was just outside of one of our hotels. We sat down to an good meal and mostly stared into space. We were majorly jet lagged. Once fed, it was time for a nap, exciting times! A couple of hours later we went met up again and decided to walk down to the Mediterranean Sea. I can vouch for the fact that it is indeed there. So, our geography verified we were hungry again. We headed back. Standing on a corner we took turns saying, “I don’t know, where do you want to eat?” Right in front of me one of the ubiquitous mopeds wrecked into the curb and another moped. I lifted the bike off of this kid and tried to do the first aid thing, but he didn’t understand a word. “Stay down, stay down, don’t get up, well at least don’t get up fast, are you hurt, you’re laughing at me, so I guess not.” He gathered up the pieces of his moped and left, apparently unscathed. So I did the only thing I could, I offered some to everyone else, I had 3 takers. One even managed to put a little in his mouth, but not for long.